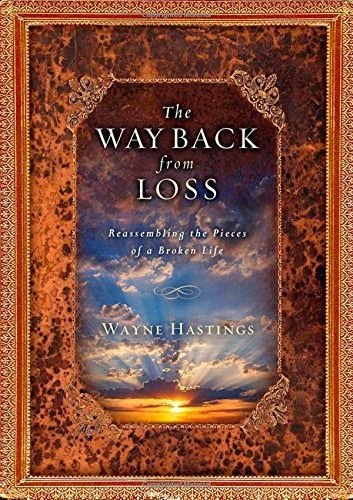 Today I want to share a devotion from my friend Wayne Hastings' new book, The Way Back from Loss: Reassembling the Pieces of a Broken Life, published by Howard Books. Through this sixty day devotional, Wayne provides a step-by-step path through the sometimes paralyzing confusion and frightening uncertainty of loss. The readings and quotes lead a wounded soul into the loving arms of the only One who truly understands your journey and knows the course of your future. "Hope Floats" (devotional number 39) is my personal favorite. Wayne says, "Hope doesn't sink us into the black hole of worry and angst; it floats. It keeps our head above water." Here's the devotion in its entirety. We can never underestimate the value of hope as we go through difficult situations. We can look at all that’s happening to us or around us and feel hopeless, or we can choose to be people who are full of hope in spite of what is happening, what others are saying, or how we’re feeling. Unfortunately we spend too much of our lives thinking. We agitate, cogitate, and worry. We suppose that if we think about something long enough, something will automatically happen or eventually change. It often doesn’t because we are so quick to worry about things that are totally out of our direct control. Hope is far better. It’s the positive expectation that something good is going to happen to us. We don’t need to think about it—simply expect it. Instead of trying to think things through, we can hope on purpose. Hope doesn’t sink us into the black hole of worry and angst; it floats. It keeps our head above water. It leads to joy and, as Paul reminds us in today’s verse, it doesn’t disappoint. So, what if we don’t see what we’re hoping for? The answer is maybe we’re hoping for the wrong things. • God has a plan for us. • God will never leave us. • God sent His Son to die for us. • God works all things out for our good. Tough circumstances don’t simply disappear, but we can experience God through it all. There is eternal value in this day. We need to approach it with a hope based on who God is and what He has promised. We must stop overthinking things, give our minds and hearts to God, and float on His life-saving hope. INSIGHT: Develop an attitude of expectancy and hope based on who God is and what He has promised. PRAYER: Ask God to help you hope on purpose. Ask Him to help you take any thoughts of hopelessness captive to Him and erase them with His promises. Thank Him that He wants you to live in joy and for helping you grow in your faith. • Study Psalms 30:5; 144:1 and Zechariah 9:12. What are the promises found in these verses? What does it mean to you to be a “prisoner of hope”? • Understand that you need to make a decision to be happy, rejoice, and have hope. It won’t simply come upon you; you need to take hold of hope on purpose. The Enemy doesn’t care about your things or your feelings. He wants your joy. It’s up to you to hold fast to your hope and renew it daily. • Discover how hope releases joy. Look up scriptures that clearly show you God’s promises to bring you hope and joy. Don’t settle for “I’ll be happy when . . . ” thinking, but rather focus on His hope for you today. She was doing well. She had just gotten remarried to a man who not only loved her, but also her children. The heart failure of the past year was behind her and with the help of a specialized machine, her body was getting stronger each day as she awaited a heart transplant. Her future seemed brighter than it had in long time. And then. . . suddenly. . . Her heart stopped pumping and in what seemed like the blink of an eye, she was gone. In my bewilderment and sorrow over her family’s loss – actually, over the world’s loss of a beautiful, kind spirited woman who lit up a room with her smile – I was struck afresh by the realization that as much as we want to believe we can control the circumstances of our lives, only God knows the number of days each of us will spend here on earth. We fret and worry. We diligently put money into savings accounts and strategize about the future. We give our children vaccinations, teach them about stranger danger and make them wear seat belts when they ride in a car. We take our vitamins, make healthy food choices (most of the time! ), and schedule our annual medical checkups. We think we are in control. But then . . . suddenly. . . The machine in which we have placed our trust fails. We come to an abrupt awareness that we weren't ever really in control and we spent so much time worrying about our future that we forgot to enjoy our present. We cannot control the number of our days here on earth, even with the most technologically advanced machines. But when we place our faith in Jesus, we can rest assured that He controls and our eternal future. Let’s continue to be good stewards of our resources, to make healthy lifestyle choices and to lovingly care for our children. But let’s also remain keenly aware that the things of this world will fail us. Worry is pointless and life is precious. We aren’t in control, but when we hold tightly to the One who is, our eternal futures are brighter than we can ever imagine.